October 05, 2017 by Anton Strout in Unf*ck Your Manuscript! 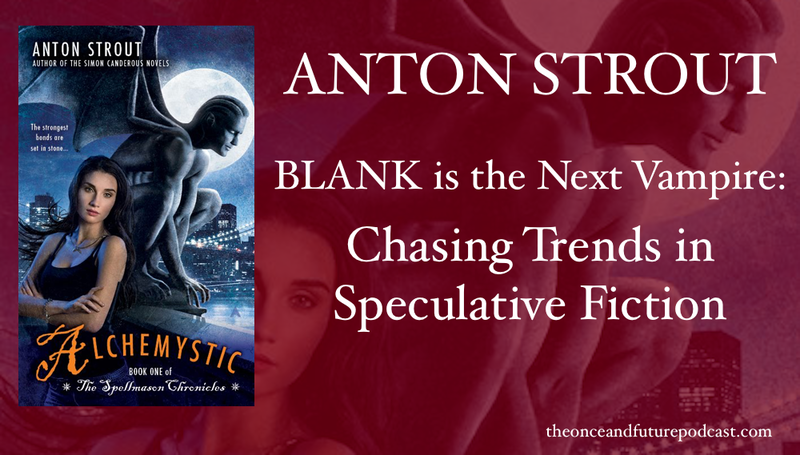 As part of our series leading up to NaNoWriMo 2017, Anton Strout, author and host of The Once and Future Podcast tells us about chasing trends. When you are planning your novel, how much should you consider what the next big thing is in fiction? I’ve been in the publishing industry for about twenty years now. Over ten of those years have been as an author: first, for my Simon Canderous paranormal detective novels and then for second series the gargoyle-tastic Spellmason Chronicles, plus many short stories in various anthologies. At every event in the book world, I get asked at a minimum of at least twice the same rumbling industry wide question: what’s the next paranormal trend? When I started behind the scenes in 1998 at one of the Big Five, vampires were the big undead man on campus. Even then, the industry was saying vampire literature was a dying trend (no pun intended). Yet here we are, years later, with vampires still making the bestseller list. Not so dead, are they? In recent years (I’m looking in your direction, Pride and Prejudice and Zombies) everyone’s favorite brain eaters have become super hot. Werewolves and other shapeshifters have also declared the new hotness. There was even a trend out there of publishing books about selkies, which—as best I can recall without looking it up—are shape shifting were-seals out for some sexay times. Over and over fantasy/romance trend pieces try to put their finger on what the next monster hotness will be, but does anyone really know? Man, I hope it’s gargoyles. That would be sweeeet. I mean, I’d be right there as the market leader with The Spellmason Chronicles, wouldn’t I? They’d make movies of my books, I’d get to fly around in my golden chopper looking down at all the little people… but I digress. Still, fingers crossed, it’s going to be gargoyles, right? Why? Because that trend you’re chasing today was decided on about a year or two years earlier. Here’s how it works. An editor acquires a book about, say, werejaguars, and it takes off. That creates a quick scramble by that editor and every other editor out there who suddenly want in on the next hot werejaguar book. Within a month the market gets glutted with werepumas, weretigers, and even weredomesticshorthairedcats. Now if Writer You decides you want in, you sit down and crank one out quick hoping to sell it to a publisher. Let’s also say you manage the Herculean task of getting out something clean and in some sort of passable shape within a slim window of six months. Then you start to shop it around. Here’s the problem… the trend that is hitting now is not necessarily the trend that will be hitting the shelf a year or two from now… which is when, if you sell your book to a publisher, it would hit shelves. You’re already trying to sell a book on a trend that may well be over. Sure, that trend might have some staying power like vamps or lycanthropes, but there is a sort of desperate writer madness in even attempting to write something for a specific bandwagon. If you’re not already on the bandwagon as it pulls away, the time it would take you to catch up with it would leave you sitting on an old one while the new bandwagon is pulling out of the station. Now, yes, there’s a chance you might get lucky and catch a trend that’s got some staying power, but honestly? There are better things you can be doing for yourself as a writer than trying to decide what the next hotness is in a genre like urban fantasy. For one, write what you love. Damn the trends, I say. Nothing makes for a better and compelling book in any genre than a writer pouring their passion into what interests them. For example, I had a love for Manhattan, its museums and its architecture. The idea to bring its gargoyles to life in The Spellmason Chronicles intrigued me. I think my passion for the supernatural and New York Gothic artistry come through on every page of the book, and it was a story I was excited to tell. If gargoyles never hit big or if their moment has already passed with Disney’s Gargoyles, then so be it. I wrote the book I wanted, and have found great happiness in doing so. The fact that it is beloved by nerdy urban fantasy lovers everywhere is just a bonus. In the end, I write the books where my passion for a subject meets the absence of a tale to be told about them. It’s my job as a writer to fill that absence by using that passion to tell the story as only I can. Trends may come, stay and go, but writing a good book can last forever.